Are You Mastering The Mental Game? Would you like to break through your mental and emotional tennis performance barriers, beat the players you know you should, and play to your full potential? Whether you're just starting out, playing for fun or are competing, The Mental Game of Tennis is your complete personal blueprint to becoming mentally tough, taking your tennis performance to the next level and mastering the mental game. Develop a comprehensive mental game plan that helps you concentrate, handle nerves and get you into the high-performance zone--when it counts most--under pressure. Build a personalized, custom pre-play psych-up system to help you get into your best mind-set before any lesson, practice or match. Stop being your own worst enemy on the court, and successfully handle the often frustrating emotions that arise in learning, practicing and competing. Avoid "the mind traps of being in the lead" and use the secrets of momentum and mental match management to win more games and sets, and to close out more matches. Defeat the gamesmanship and mind game psych-outs your opponents use to try to get into your head, upset you emotionally, and get you off your game. Overcome slumps, burnout, the fear of losing, the fear of winning and develop a tremendous never-give-up mentally-tough competitive attitude that wins matches. Use the mental game secrets of world-class tennis pros from the over 50 interviews the author has conducted in his 30 years of research in sports psychology. Learn from John McEnroe, Jimmy Connors, Bjorn Borg, Rod Laver, Pete Sampras, Boris Becker, Chris Evert, Billie Jean King, Martina Navratilova, Andre Agassi, Mats Wilander, Jim Courier, Jimmy Arias, Stefan Edberg, Michael Chang, Steffi Graff, Virginia Wade, Martina Hingis and others. Diagnose your mental game with a comprehensive and easy-to-use self-assessment tool that instantly helps you discover the exact mind-body problems in your tennis and the exact answers to resolve each of them. This ultimate, one-of-a-kind mental game success manual shows you, step-by-step, how to overcome the mental obstacles and competitive pitfalls that have been holding you back from playing great tennis. A whole new level of peak performance tennis success is awaiting you. Are you ready to reach more of your tennis potential? Bill Cole, MS, MA, is an internationally recognized expert on peak performance, coaching and the mental game. He was a two-sport athlete at the national level, and played pro tennis in the 1980's. He has coached at the highest levels of major-league pro sports and big-time college athletics. Bill is a Wall Of Fame Honoree, an award-winning scholar-athlete, and a published author of numerous books and articles. For three years Bill was the Sport Psychology Coach for the Israeli Davis Cup team. He spent time with the team at major events worldwide, including Wimbledon, The US Open and Davis Cup in Europe. Dedi Jacob, the Head Coach, wrote this testimonial about Bill's time with the players. "Bill is a very talented and deeply-knowledgeable mental game coach. His ability to help our players stay motivated, focused and on-track is just excellent. Bill really takes the time to understand people, to listen and to figure out what each person needs to achieve and excel. He has crafted a comprehensive mental game peak performance program for us, as a mental game advisor to individual players and team mental game coach for team practice sessions. He is a master mental game coach. He is one of the top peak performance coaches on the Pro Tennis Tour. More players on the pro tour could use his help." Learn more about Bill Cole, The Mental Game Coach. 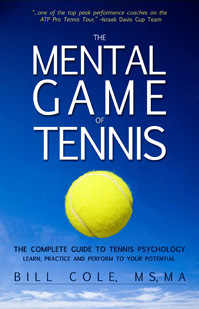 The Mental Game of Tennis is scheduled for publication in 2017. You can order the book in advance from Amazon.com. Download high-quality PDF files of the front cover and back cover of The Mental Game of Tennis book.